Q: What’s missing from this picture? You have from now until Sunday February 7th to comment on any of our 2010 blog posts. For each comment you leave, your name will be entered into a drawing. If your name is drawn, you will receive something red and frilly from Yours Truly just in time for Heart Day! It is almost the big Heart Day and I have a few things to say about it and am hoping you do too. I know a lot of us are disgruntled with consumerism run amuk and that Valentine’s Day is now seen by many as just another ploy from the greeting card/floral industries to guilt us into spending too much. This got me to thinking and recollecting…mostly recollecting. What I am thinking is this; most of us are pretty happy when someone they care about (or even a stranger, for that matter) goes out of their way to be thoughtful. And, for most of us, the thoughtfulness does not require mass amounts of stuff (I said most of us). I very much hope we all have touching Valentine’s Day stories that back up my theory. Here are a few of mine. When I was in fourth or maybe fifth grade my mom wrote all of my fellow students’ names on their Valentine’s cards in Calligraphy. Lots of these kids kept these Valentines in their desk long after the big day because they felt special every time they saw their name all pretty-like on those cheap little see-through white envelopes. Thank you for doing that, mom. A decade or so later, my then boyfriend Tom wanted to give me a Valentine but had little money. He handed me a single red rose with a ribbon attached. Tied to the ribbon was an abalone shell ring. Tom died last year at forty years old and even though we had fallen out of touch I will always treasure that ring and how special he made me feel that day. My friend Mary loves hearts and so do I. A couple of years ago my friend Laurie helped me make heart soaps in honor of Mary for Dakota Blonde’s Annual Valentine Show raffle. Last year, during the concert, Mary surprised me with three beautiful black and white photos of the band, one in a sweet antiquey silver frame. Warm Fuzzies. 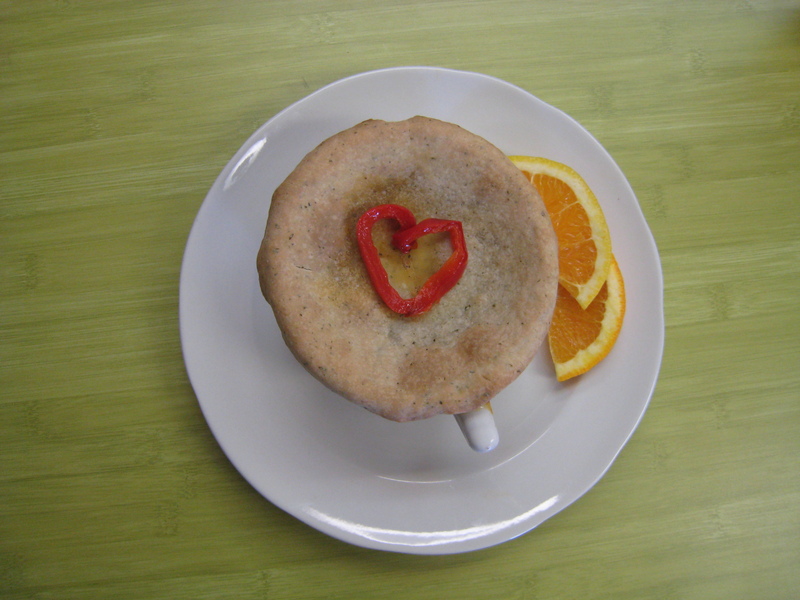 As for the pot pie you see pictured above, this was not a Valentine – but the bonus red pepper heart brought much happiness that day and this photo pretty much sums up what I am getting at. I was a very happy woman…all for under five bucks (can’t remember – may have even gotten an employee discount on it). 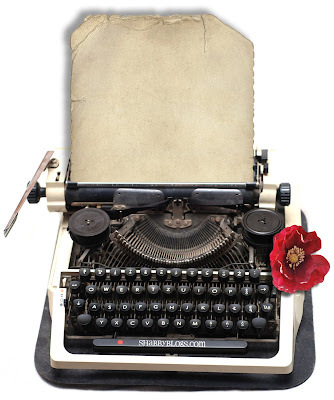 I am pretty sure I don’t need to tell you this…but it would be great to hear some of your very own Valentine’s stories : ) Just click the comment link above and type away. PS I have nothing against cards and flowers. I love them both. I just think we could all use a little reminding that there are lots and lots of (inexpensive) ways to love and be loved. Here’s wishing us all extra X’s and O’s this Valentines Day! PS I just sent 50lbs of random soap chunks in 2 large Priority Mail boxes, which cost me $29 total. Two normal boxes would have cost me around $80 to send. Be sure to use the “Flat Rate” boxes, which you can pick up free of charge at the post office. Since Paul and I began caretaking last year, we have had several requests to house and pet sit across the states. Because our current sit is long term (one to two years) we are currently off the market. For this reason, I have been putting together a list of people we know and trust who caretake so that when Paul and I are asked for a reference I have their info at my fingertips. Kevin and Alicia Shea make it easy for me to refer them for several reasons. I met Kevin while browsing a house sitting forum on www.housecarers.com. It was here that I noticed that he and his wife Alicia live in Massachusetts (not far from our current sit) and had recently been profiled in a New York Times article (please see my November posts for the full article). “Later this month we are off again. 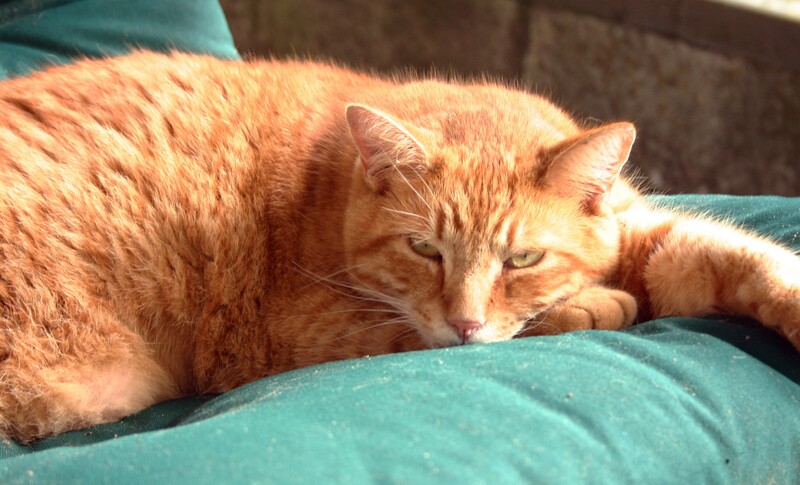 This time it will be a repeat sit in Northeast CT taking care of our now long term friend, Bob the cat. I can’t remember exactly but this will be the 5th or 6th time for this client. They were our first way back in June 2008. We thoroughly enjoy this sit as we have our choice of staying in the main house or at the cottage down the path from the main house. We sometimes stay in the main house for the week and then “vacation” to the cottage for the weekends. A different driveway to the cottage makes it feel as if we are truly in 2 different places, … except that Bob knows where we are and saunters over. Bob’s favorite thing is to pluck on the window screen in the office. He gets to it by hopping up in the porch handrail, and then strums it so as to tell us, “Hey, open the door!”. So the door valet gets up, opens the door and waits the designated time as Bob slooooowly enters the house. Of course, he then eats a bit and leaves quickly through his cat door. 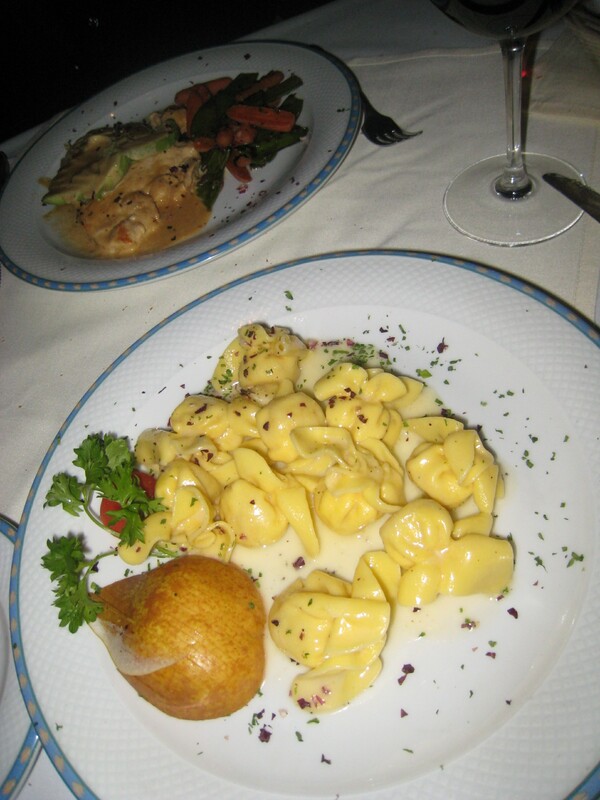 We have gotten to know the homeowners friends and they will be our dinner guests, again, on our first weekend there. It is rather funny to be entertaining folks who know the place better that we do and who can tell us where their preferred beverage is located. Our dinners with their friends have been such fun and so talked about, that the homeowners invited us for a weekend just so that they could enjoy the fine cooking and have a few laughs. So, my main reason for referring this couple is that these are the kind of people I would want to be taking care of our home and pets. Kevin and Alicia not only caretake – they establish relationships and clearly enjoy the lifestyle they have created for themselves. Thank you Kevin and Alicia for allowing me to share a bit of your story! *If you are looking for caretakers in the near future, you can contact Kevin and Alicia through their website, which is listed above and to the right, under blogroll. If you are interested in caretaking, feel free to contact me for ideas and inspiration. Or, If you simply have any questions and/or comments to share, please click the comment link at the top of this post – I love comments! I know nothing about New York real estate. 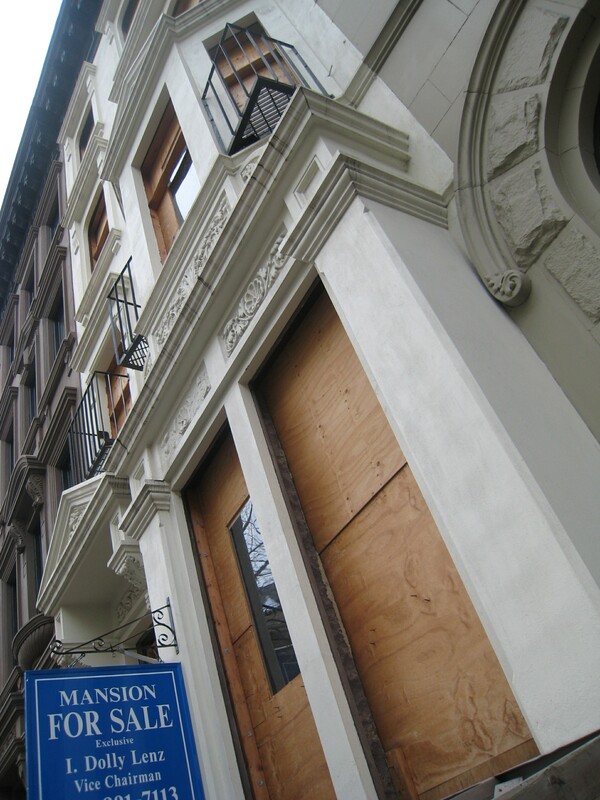 That being said, this mansion is for sale on the Upper West Side and I am tempted to call the realtor and ask if the doors and windows are extra. Just curious, is all. If it weren’t a waste of people’s time, I would love to see the interior. But it is a waste of people’s time. Maybe if I said I was an up and coming blogpreneur? I mean, I did just break the 3,000 hits mark (thanks all)! Still, a waste of people’s time. Drat. 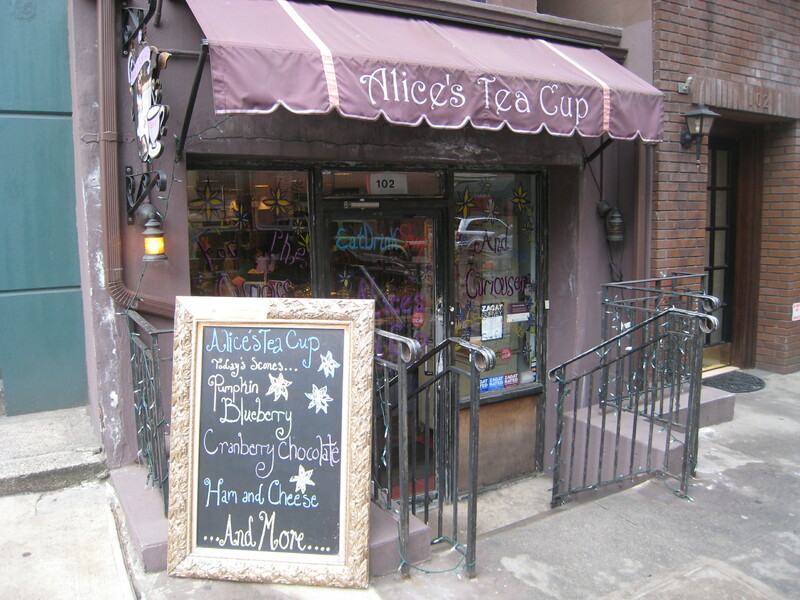 Alice’s Tea Cup is really sweet (as in Strawberry Chocolate Scones sweet). I asked for lavender tea and ended up with this wonderful blend… “Serene is the composition of chamomile blossoms, lemon verbena, wild crafted linden herb, organic peppermint leaves, organic osthmanthus flowers, organic jasmine blossoms, organic lemongrass and lavender flowers”. Bliss. And they make their own Ginger Soy Dressing. I could drink it. Seriously. And Ireland. 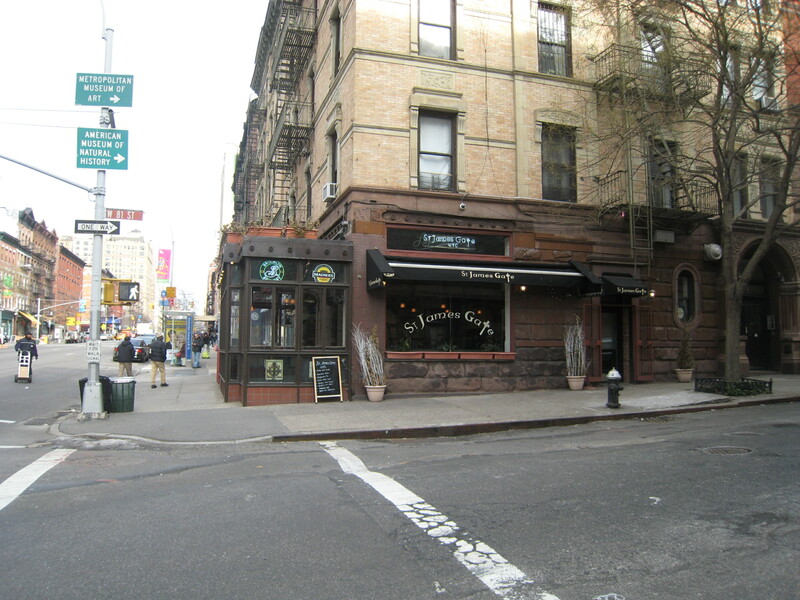 I certainly could not visit NYC without stopping in an Irish Pub. Of the several times I have been to New York (as an adult, anyway), I have proudly upheld this tradition. These pics were taken towards the end of our stay. 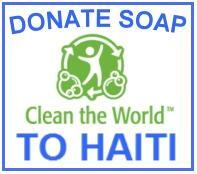 Haiti was hit by a 7.0 earthquake the night before and I couldn’t sleep for thinking of all the people in crisis. Having been thrown out of bed and across the room during the Northridge Quake (CA) in 1994, I know the damage earthquakes and their aftershocks are capable of. The Northridge Quake was a 6.7 and no where near as devastating as what Haiti is now facing. 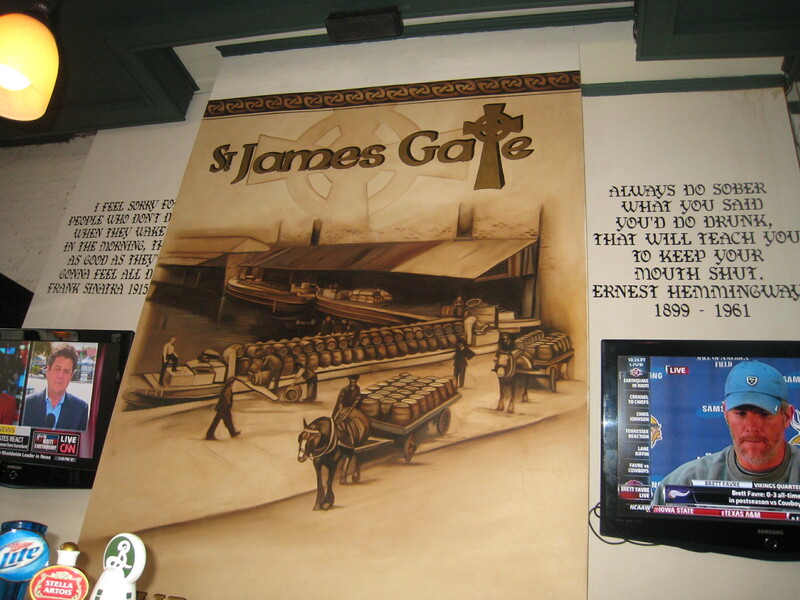 So, while Paul met with coworkers on Madison Ave, I hoofed it to one of my new favorite streets and found me St James Gate and ordered me an Absolute Bloody Mary (because drinking always helps, she thinks sarcastically to herself). Bartendress Siobhan and I contemplated many things; mostly having to do with technology and the quake. A man named LR at the end of the bar piped in every now and then…he reminded me of the man who sits at the end of the bar at Vesuvio in San Francisco; similar beards and caps and dress; as if they stepped out of another era. A better era. LR drank his pint and whiskey while reading Chronicles, Volume One (for the fourth time) until he decided to get back to work, warning Siobhan that he would most likely be back later. ..